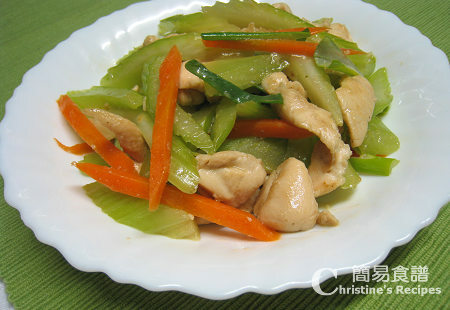 This dish, Pan-Fried Chicken with Celery is very popular in Chinese home cooking. It’s a quick stir fry, with less preparation work. I bet many kids who grow up in Hong Kong would know this dish very well. It's interesting enough to realize a fact that not all people like eating celery because of its unique flavour, yet for those who like would just love its aroma. Not only I love the smell of celery, but also its crunchy texture. I’m not saying about those overcooked celery of course. Celery is high in dietary fiber and contains many vitamins. It is an ideal food for people who are on diet. Well, I’m not on diet, yet eat celery once in a week at least. That said, celery can help lower blood pressure too. Rinse celery and drain well. Use a knife to help peel tissues in celery stalks. Cut into strips. Marinate chicken with marinade for 15 minutes. Heat oil in a frypan. Stir fry chicken until colour turns white and cooked. Set aside. Add oil and sauté garlic and shallot until aromatic. Add carrot and celery. Sprinkle salt and sugar to taste. Pour wine and stir fry quickly. Add chicken stock and cook until carrot and celery softened. Toss in chicken, add shallot sections and combine well. Add thickening and cook to your preferred consistency. Serve hot. My mother has a little secret to stir fry celery. Just add a bit sugar and that would make a big difference in taste. Don’t add too much because you don’t want to eat sweet celery. The taste of this dish is quite natural. Add some satay sauce while stir frying celery to add a kick if you like. Celery is an underated vegetable in my book. I always love it cooked like this and add to to may a stir fry. The recipe you have hear looks good and tasty and I cannot wait to try. I can view the pics though. Let me know how it goes if you try. Ill try this for my kids. Surely they will love this meal. Sumptous!